Advocate Good Samaritan Hospital, an acute-care medical facility in Downers Grove, Illinois, has evolved during the past 35 years from a midsized community hospital to a nationally recognized leader in health care. By leveraging its core competency of building loyal relationships as well as organizational transformation of “moving from good to great,” the hospital has achieved exceptional clinical, service and financial outcomes. 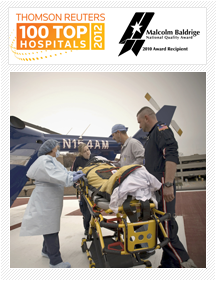 Deemed a 100 Top Hospital by Thomson Reuters for 2011 and 2012, Good Samaritan Hospital was the only health care organization in the nation to earn the prestigious 2010 Malcolm Baldrige National Quality Award, which represents the highest Presidential honor for performance excellence and quality. The hospital also received the state’s Baldrige equivalent – the Lincoln Gold Award for Achievement of Excellence – in 2010. Good Samaritan Hospital features DuPage County’s only Level I trauma center and a certified Level III neonatal intensive care unit. The hospital is noted for cancer care, women and children’s services and surgical services and has received the American Nurses Credentialing Center Magnet® designation, the highest honor and level of recognition awarded to nursing excellence in national and international health care. The 333-bed hospital has a workforce of 2,700 associates, 450 volunteers and 950 independent physicians representing 59 specialties. Three outpatient centers bring immediate care, diagnostic imaging, cardiology, physical therapy and laboratory services into the community. Good Samaritan Hospital is part of Advocate Health Care, the largest health system in the state of Illinois.